Vintage style telescopes and binoculars. Brass and alluminium telescopes, opera glasses and field binoculars. A variety of high-quality magnifying devices for terranean, subterranean, and lunar exploration. Essential tools for navigators and explorers, or just a stylish prop for your office or study. We also offer a range of retro compasses and provide Free UK shipping for all items. Ornate opera glasses in a classic binocular style. Ideal for the theatre or a day at the races. Polished aluminum binoculars with a matching wooden storage and display box. Field glasses are the ideal choice for lively outdoor pursuits. A smart item for the gentry at a price affordable by all classes. Includes a leather carrying case. 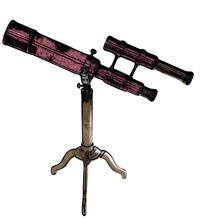 Reproduction (Anderson & Wiggins, London Paris 1887) lacquered brass refractor telescope. Grand brass telescope. The perfect device for discovering the solar system or monitoring tha Martian approach. Great for beginners and dilettantes.